Today I had the privilege of showing the Lillian & Albert Small Jewish Museum to a group from Australia! Thirty students from Notre Dame University in Freemantle, Australia, are here in Washington for three weeks, studying American politics and D.C. history at the Catholic University of America. 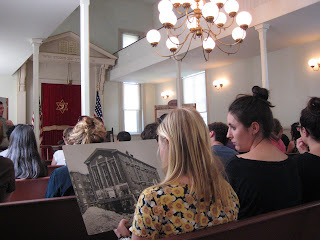 Their professor, Leslie Woodcock Tentler from Catholic University, brought them to Washington's oldest synagogue after they toured other parts of the neighborhood. I explained the building's unique history--and how it fits into the history of this neighborhood, the Jewish community, and the city writ large. The picture shows students examining what the synagogue looked like just after its move in 1969. We love to have classes -- from kindergarten to college, from our city or from another hemisphere -- come by our building and learn about Washington's Jewish history. At the university level, it's perfect for a D.C. history, urban history, or American Jewish history class. Want to bring your group by? Click here for more information!